The remnants of many years of teaching. There’s more boxes on the other side, not to mention in the basement! 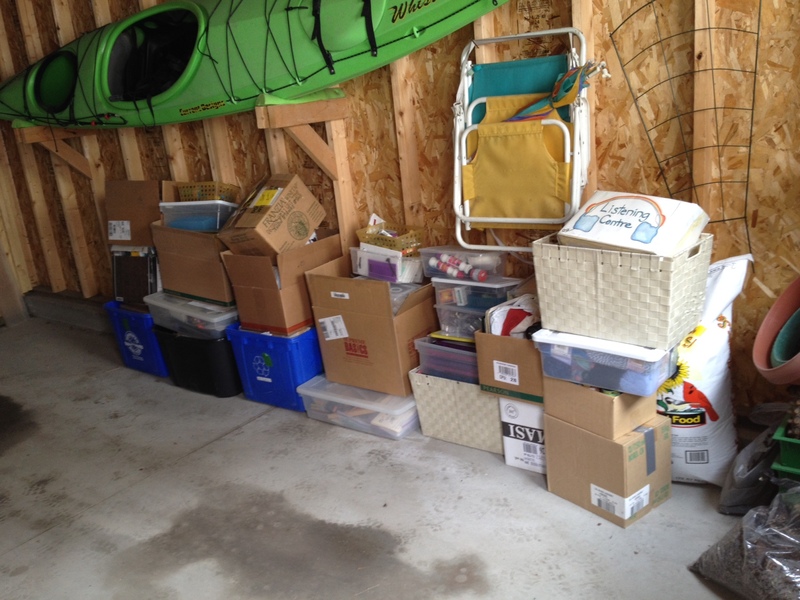 When I first got the boxes, I peeked inside a few and valiantly tried to sort through things, but it was too soon, not to mention too cold in the garage where they’d all been stashed. But even when the weather got warmer, it was easier to ignore what I was leaving behind. By August it’d been over a year since I left full-time teaching, and I knew it was time. I’d had enough distance from my old full-time job that I could let go, a process that had already begun. Three piles began to form — throw away/recycle, give-away, and a (hopefully small) keep pile. It’s been such a strange process to look back over a lifetime of things that once defined me. First of all, wasn’t it just a few years ago that I began? Was I a brave or just plain foolish soul back in 1987 when I got my first job? Probably like most teachers, I was a mix of both. Teach French? Sure! (The fact that I knew only the tiniest bit of french was no obstacle.) Organize the Christmas concert? No problem! Oh how courageous the young are. I had no idea what I was doing as I encountered situations they didn’t teach you in university. Like all teachers everywhere, I improvised and learned on the fly. They say courage is only fear that has said its prayers so I guess you could say I exercised courage. 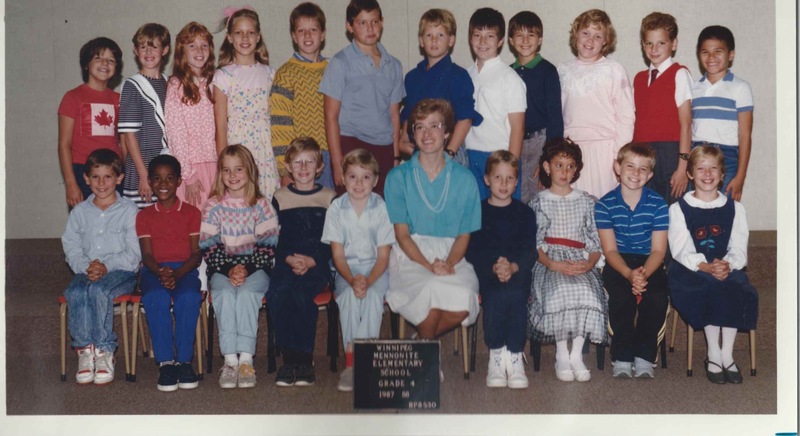 Yeah, that’s me in the middle, way back in ’87. Oh so brave. I wouldn’t have predicted that almost 30 years later, all that effort would end in a state of burn-out, but I’m sure I’m not the first or last. (I’ve found that not everyone talks about it!) As I began opening the boxes, looking through reading plans, spelling programs, math units and projects, books on “behavior management”, music materials — all tools I had used in my role as teacher —I strolled down memory lane. I was not at all unhappy to part ways with the remnants of the math testing system our division uses. I opened boxes of the paper teachers are so fond of, pages and pages of worksheets that had gone unused — these got shared with an inner city kids art centre. I looked fondly at pictures of students smiling on field trips, or engaged in class activities. Not all made me smile though. One picture was of a grade 5 boy who was tragically murdered in Winnipeg streets as an adult. Each of those students has made an imprint on my heart in some way or other. Each of them across the spectrum became my teachers. As I sorted and sorted some more, my heart went out to the 26 year old who began. Newly married, I got used to my new name, “Mrs. Penner.” Though I love kids (still do), the world of teaching always felt like fitting a square peg in a round hole. As any teacher will tell you, among all the hats you wear as a teacher, the hardest one is being “on” all day, being the manager of the class, walking that line between being firm yet fair. Many days, “Fake it till you make it” became my mantra. One of the dangers, for me anyway, of sorting things from the past is getting snagged in too much sentimentality. Tender and emotional remembrances can feel kind of good, but they can have a dark side, especially when the excessive feeling doesn’t have a basis in reality. (Think Tony Soprano and his cruel cronies sniffling at old movies.) It was well and good to have my heart well up in thinking of all the students, but defining all those years with sentimental goo was over-simplifying and even idealizing things. There was much good that came as I stretched my teaching wings all those years, but if I was totally honest, many times the constant task of being “on” for the kids, and playing the many, many roles felt more like an emotional wringer. A wringer which in the end brought about an early end to my task. I recognized that another danger of letting too many teardrops fall into all those boxes was the temptation to forget the future. They say that when God closes a door, he opens another window, and that has been the case for me. I’ve worked with students in a different capacity at St. Aidan’s School, teaching English to new Canadians, but the best window that’s opened for me has been more writing and editing. In the last months, I’ve been editing old sermons from various community members at Watershed, and summarizing the contents of our study in Revelation for an upcoming blog. It’s like I’ve been handed the best job description ever — to steep myself in the vast mystery and depth of the Christian faith. So as I unpacked and said good-bye to so many years of my life, I dug beneath the sentimentalism and felt gratitude as I contemplated my life with more realism. Gratitude that despite the many bumps along the way, God had guided me so often in my teaching journey, providing me not with an easy life, but a meaningful one, with friends who encouraged me to build my foundation on Christ. I was not a perfect teacher, but I was guided by One who is. Still am. When I first thought of letting go of my past identity as “Mrs. Penner,” my mind was filled with denial and a bit of horror. How on earth could I do it? But Christ was definitely behind me all those years, even and especially in times when I didn’t always see the big picture. I think I will always notice Him behind me, teaching me the lessons from those years. Christ has been within me nudging me along when it was time to call it quits, reminding me that all these things we identify with on this earth are only temporary. And Christ is before me, always showing me what the next step is. Like God’s children everywhere, God has all our backs, and like the best Parent ever, wants only what is good for us.